“Poke” in Hawaiian means to cut into pieces or to slice, and poke bowl is a traditional dish originated from ancient Hawaii. Today, Hawaiian poke bowls are usually mixed in with Japanese style, for the preference of modern people, the taste of this dish was consisted of both eastern and western flavors, bursting out a new cultural experience on your taste buds. 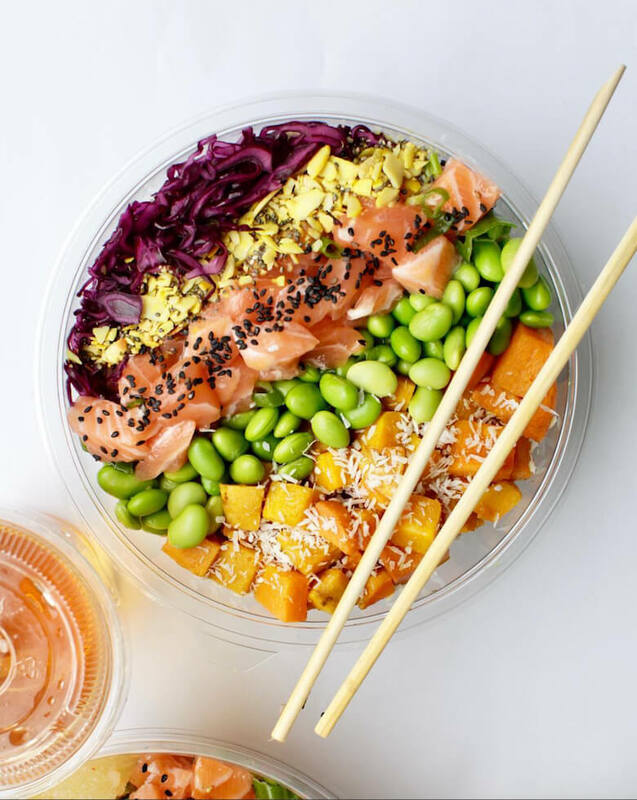 Where can you get a poke bowl? This would date back to the last October, when I was going to a Korean bbq restaurant, I spotted this “Iron Poke” next to it. Not knowing what it was, I decided to give it a shot next time. A couple days later, I went back and ordered a poke bowl. The ordering process was like a “Subway” store, but instead of large subway bread and chicken, we get to pick the “base” first. For the base, there are sushi rice, (Japanese would add a bit of vinegar in the grains so they taste sweet) brown rice, organic mixed green, and half and half. I chose sushi rice, cause I love the sweet taste of the white rice. Second, it’s the “protein” section. There are tuna, spicy tuna, salmon, spicy salmon, shrimp, crab meat, grilled chicken, and organic tofu. For a large poke bowl, I got to pick 3 of them. As a fanatic salmon sashimi lover, of course I would pick three salmon as protein. Next, are the mix-ins, sauce and toppings, where customers can pick your own additional ingredients to their customized poke bowl. In the large variety of seasonings and toppings, I chose soy sauce, honey wasabi, scallions, red onions, corn kernels, cucumber slices, and tobiko. The cook was very kind and polite all the time during the process, but he would mix all of the delicious nutritions in your poke bowl in front of you, which I found it very annoying, because I can’t wait to enjoy it. Finally, the poke bowl is done! Tasted like heaven. The sauce was absorbed by the sushi rice in just the right amount, and the seasoning well matches the fresh raw salmon meat. This customized poke bowl combination was perfectly tailor-made for my stomach. Absolutely a killer for the gourmands.